Ok, maybe this post would have been more timely coming out before Thanksgiving. That’s when Brussels sprouts are the most popular after all, as a holiday side dish. I mean I’m always on time arriving to an appointment or event, but posting the right subject at the right time? Hmmm….need some improvement there. Working on it though! For this recipe, though my timing may not be the best as it is spring and delicious winter vegetables are just beginning to wane at the market. However because interest is still out there – here goes! 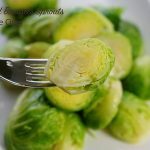 Steamed Brussels sprouts are an easy side dish, healthy too! You know I love my veggies, braised chard, artichokes or roasted carrots with mint – such delicious flavors so simply done! If you’re following my blog then you probably love fresh vegetables as much as I do! 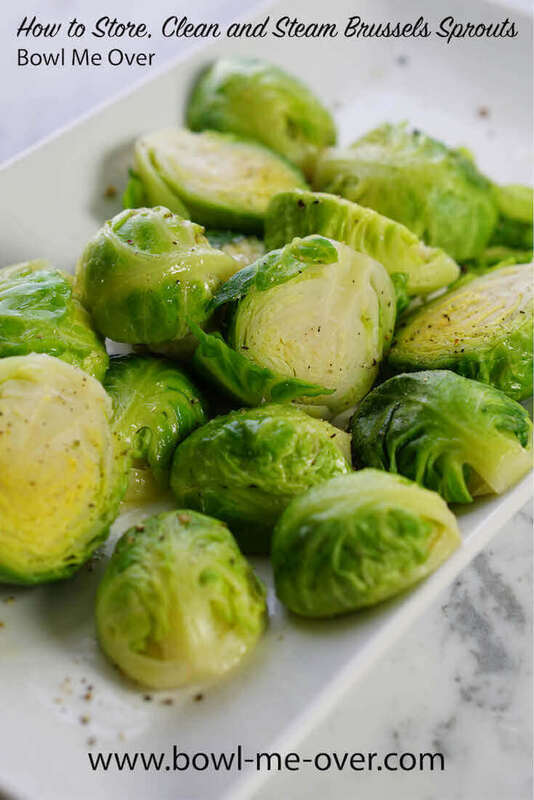 When you purchase Brussels sprouts at the store there are three different ways they are available – on the stalk, picking out loose sprouts in a bin, or pre-sliced in a bag, ready for cooking. The last option is my least preferred method. Often times the sprouts are beginning to brown around the edges. They just aren’t as fresh. On the stalk is the BEST way to get fresh sprouts, though the large stalks can be hard to store. Most often I hand pick loose sprouts, this enables me to purchase exactly what I need for my family and the recipe I’m working on. Perfectly steamed Brussels sprouts are a healthy delicious side dish. When you bring them home, do not wash them, however do pick off the brown outer leaves. Store them in a plastic bag in the crisper drawer until ready to use. If you bought an entire stalk, again remove the brown leaves but keep them on the stalk. You’ll want to store these in a plastic bag, also in the crisper drawer. This will keep them fresher, longer. First clean the Brussels sprouts by rinsing them in cold water. Remove any outer leaves that are brown and snip off the end. First rinse them in cold water. This will help remove any dust or debris. Remove any brown leaves and with a sharp knife remove the end (just the tip) of the sprout and discard. Slice in half. 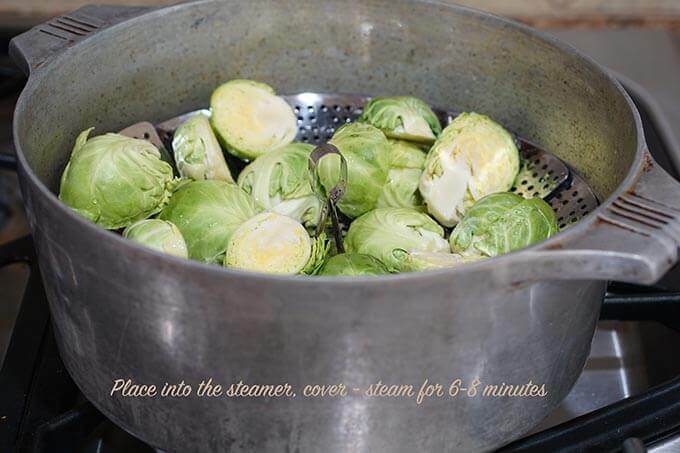 Place the Brussels sprouts Into the steamer – steam for 6-8 minutes or until fork tender. With a steamer – place the steamer in the pot, fill with water to the bottom of the steamer, add a tablespoon of salt. Cover and bring to a boil. 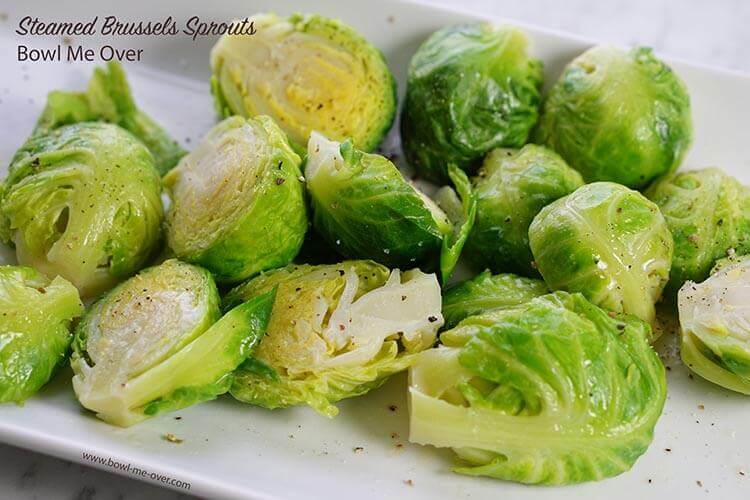 Add the Brussels sprouts, cover again – steam for 6-8 minutes or until fork tender. Without a steamer – place the Brussels sprouts in a large pan. Add water just to cover. Sprinkle with salt. Cover and bring to a boil over high heat. Steam for 5 minutes or until fork tender. Easy enough right? Delicious too! I love my fresh veggies. Easy enough right? Let’s get cooking! Steamed vegetables are a great way to serve a healthy side dish, without adding additional calories or heavy sauces. Delicious too - steaming keeps them bright green and fresh. Clean the Brussels sprouts by rinsing them in cold water. This will help remove any dust or debris. Remove any brown leaves and with a sharp knife remove the end (just the tip) of the sprout and discard. Slice in half. With a steamer - place the steamer in the pot, fill with water to the bottom of the steamer, add a tablespoon of salt. Cover and bring to a boil. Add the Brussels sprouts, cover again - steam for 6-8 minutes or until fork tender. Without a steamer - place the Brussels sprouts in a large pan. Add water just to cover. Sprinkle with salt. Cover and bring to a boil over high heat. Steam for 5 minutes or until fork tender. 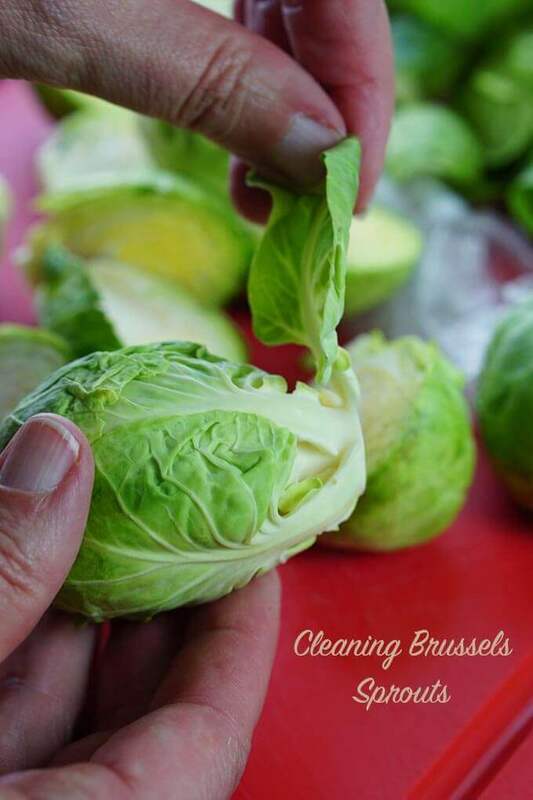 Simple set-by-step directions to store, clean and steam Brussels sprouts. 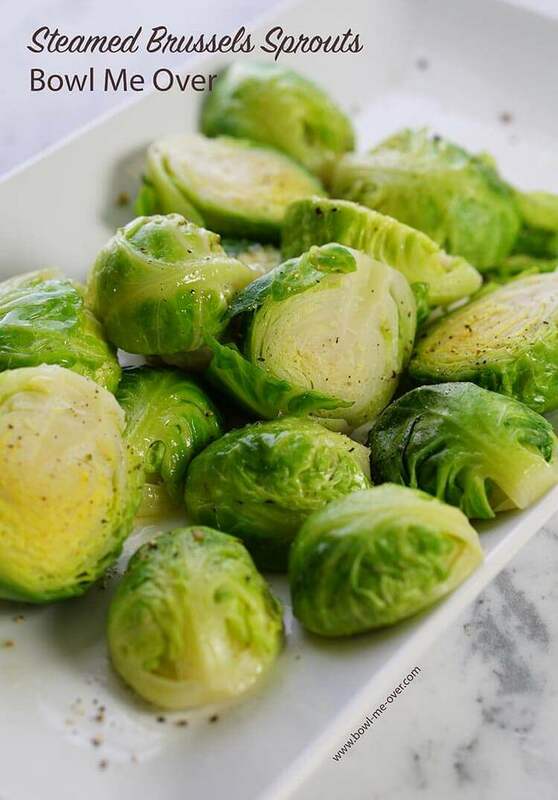 How to store, clean & steam Brussels sprouts – Steamed veggies are a great way to serve a healthy side dish, w/out adding additional calories or heavy sauces. Thank you Liza! I love my brussels too, so yummy and when they are fresh, they are almost sweet – thank you as always for all of your support!! Those are some helpful tips, Debra. I am a huge fan of Brussels sprouts and sometimes they go bad if I don’t use them up on time. Steaming them is such a good idea. Thank you so much Rini – I agree, sometimes it’s hard to eat fresh veggies before their due date – sometimes I’ll freeze them too to use in broths also. I hate throwing things out! Brussels Sprouts are one of my all time favorite veges! Our neighbor had a bunch in his garden at the end of the season that he didn’t pick and offered them to us. I have never had them fresh from the garden, they were unbelievable! Great post! My hubby and I were just talking about putting in a garden this year. I so agree, there is NOTHING like fresh veggies – so yummy! Thank you Beth for stopping by! It’s okay…I’m not very timely either. But I love brussels sprouts so thanks for sharing these tips. Oh good, LOL! I’m glad to hear I’m not alone. Thanks Stephanie! I never make steamed brussel sprouts but these look delicious and I love all the detailed directions. I love having quick, easy and healthy recipes like this that I can rotate through each week! Thank you Karen, I’m glad you’ve found this helpful! I’ve been doing more steamed veggies lately and love that quick easy option. Have a great rest of the week! Brussel Sprouts are a favorite in my house but this quick and easy method is a great idea for busy weeknights! Such an easy quick side – thank you Catherine! My family loves Brussels sprouts and we have them all year long. You are right, on the stalk is better. In the fall, we get them on the stalk from the Farmer’s Market. Great tips on cooking and storing. The fresher the better, always makes a difference! Thanks Cynthia, I appreciate you stopping by! I’ve only had brussels sprouts a handful of times, but I really like them. I can’t wait to try your recipe. Maybe for Easter. Nothing fancy here, but certainly an easy & delicious side dish – thank you Debi! Thanks Suzy, I appreciate you stopping by! I understand Maeva – Brussels are a veggie you love or not! That’s ok, there are lots of others to enjoy!! We love brussels sprouts all year long in my house, so this is perfect! Me too, Brussels are always a great choice – thanks Lisa! I didn’t love brussels sprouts until I had them roasted. I will definitely be trying this steamed recipe for sprouts. Even when I was a little girl I’ve loved Brussels. I must be weird, haha! I hope you enjoy them steamed, they are so good!! I usually roast brussels sprouts, but steamed are a faster way to cook them. I’ll give it a try. They sure look delicious! Roasting is another delicious way to enjoy them Sandra, I like pan roasting them also! I LOVE brussels sprouts and when I first started cooking fresh brussels sprouts didn’t know how to cook them. This is a perfect post for sure! A lot of folks have found it helpful, thank you Julie!! This post is so helpful. My husbands favorite veggie is Brussels sprouts, and I always mess them up.! Cant wait to put my newfound knowledge to good eating! Yum, yum, yum – enjoy Michele and thank you so much for stopping by! these look like the perfect side dish!! Brussels sprouts are such a great veg, thanks Michaela! This is such a timely post on Brussels sprouts. I love them and I think that one of the reason that people think that they don’t care for them is because they don’t know how to prepare them. Your post takes away part of the mystery, in words and beautiful pics. Thanks for sharing this one! 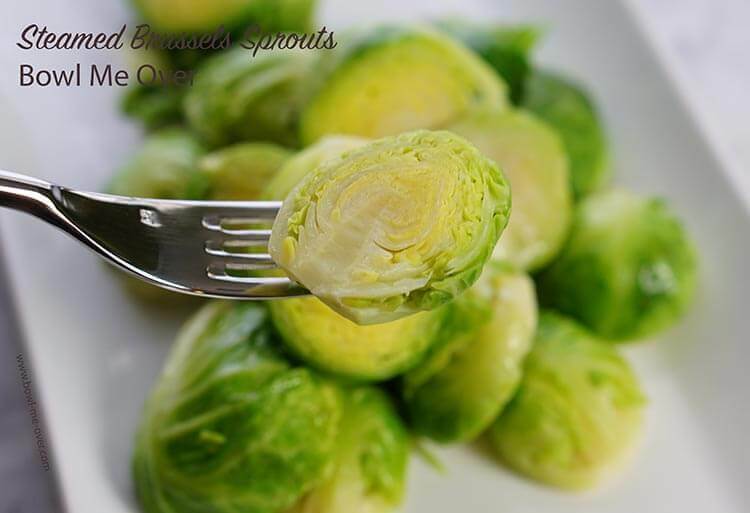 LOVING your wonderful tips and this Brussels Sprouts recipe is so good! I love my Brussels but this recipe is so simple and yet it will turn out so delicious!